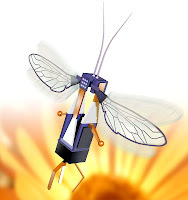 So the big brains over at Harvard are apparently building an army of robot bees. And the National Science Foundation just gave them a $10 Million computing grant. So being of green mind, my first thought was of course environmental. Really? Bees to pollenate flowers since bee colonies are dwindling? Wouldn't it be better to, I don't know... save the bees? But it turns out that pollenation has absolutely nothing to do with this project. In fact, this research is geared to understanding hive mentality with the hopes of figuring out more about hive networks and adaptive computing. Which is still really kewl. It always amazes me what the big brains are working on.